Our attention was drawn to a front page editorial comment against the Government and people of Abia State published by Sun tabloid on 21st March 2018, with the caption “As Abia descends into rot”. We decided to take some time to find out why a supposed reputable national daily will choose to descend into brazen unprofessionalism that is globally associated with FAKE NEWS outlets. Having concluded our investigations, our response is more of sympathy for the editors of the media outlet whose journalistic hands and legs were apparently tied by their publisher, who is engaged in one of his regular political malfeasance aimed at distracting the vulnerable. We are now fully aware of the recent mass disengagement of Sun workers who refused to sell their journalistic souls. We are also aware of the scheme to provoke Abia State Government into a media war that will only serve to waste the scarce resources of the people of Abia State, without adding one meter of road to the infrastructure stock of our state. 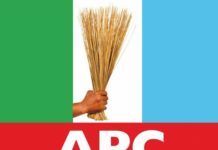 We will not travel that road or abandon the work of the people of Abia State to chase after publicly discredited folks struggling to reinvent themselves and their long moribund political careers using their ill gotten free access to the media. The work of Abia is paramount to the government of Abia State, led by Dr Okezie Ikpeazu, and that alone we must invest resources on. Our considered response to Sun editorial team is simply to refer our people to two extracts from previous publications of same Sun tabloid. “Nigeria Union of Pensioners, Abia State Council, has called on the state governor, Dr. Okezie Ikpeazu, to include pension arrears owed its members when clearing debts owed civil servants in the state. In case the editors of Sun have forgotten, we wish to remind them that the publisher of Sun Newspaper, Dr Orji Uzor Kalu, was the Governor of Abia State between 1999 and 2007. It was his administration that owed pensioners and salaries of workers running into months of of unpaid wages and pensions, as stated in their own publication. 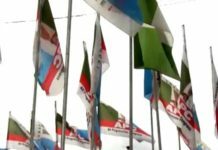 For instance, the younger brother of the Sun publisher, whom he installed as the Chairman of Aba North Local Government Area, did not only leave the LGA with very high debt running into hundreds of millions of Naira owed to commercial banks, he also left the LGA with a staggering 14 months’ unpaid wages to workers and pensioners. If the editor of a newspaper, with first-hand information on the feeling of Abia voters, volunteered such opinion, the question becomes; who exactly authored or ordered the editorial comment of Sun as published on March 21st 2018? What manner of pressure was brought to bear on the members of the editorial board of Sun to cajole them into ridiculing journalism? The administration of Governor Okezie Ikpeazu deliberately chose to focus on the task of accelerating the development of our dear state rather than inundating the people of Abia State with excuses and blame sharing. That is why we have never gone on record, in public, to inform our people about the origin of the salary and pension payment challenge in the state which dates back to the 1999-2015. We are also not interested in comparing administrations or states, otherwise we would have been pointing out that the neighboring states Sun mentioned, in comparison to Abia State, had development structures inherited from 1999-2007 era which subsequent administrations built on. Maybe others can ask Sun editors to point to one single project or legacy left in Abia State by their publisher who presided over our state for 8 years, that we inherited to build on. Despite the failures of the 1999-2007 administration in the state to lay proper foundation for then young Abia State at the inception of the 4th Republic, it is on record that we have focused on solving the problems and remedying the foundational defects of the past. As at today, we are not owing any worker serving in our Ministries, Departments and Agencies (MDA), as they have all received February 2018 salary and we are still in March. It is also important to note that those categories of workers constitute more than 70% of the state’s workforce. While we are up to date with salaries of MDAs, we are working hard to bring other categories of workers and pensioners to the same level. But in doing so we necessarily must keep an eye on the revenue profile of the state and the need to also provide dividends of democracy to the remaining citizens and residents of the state who constitute more than 99% of the population of Abia State. Even with the foregoing, we have diligently managed the resources of the state to ensure that primary school teachers are now owed only 2 months arrears while secondary school teachers have 4 months arrears as against what we inherited. While we acknowledge the gap in payment between MDAs, teachers, pensioners and some parastatals, we remain determined to ensure that we quickly arrive at the point where all genuine workers in the state receive their wages as at when due and in a sustainable manner. Despite the heavy weight wages exert on the state’s lean resources, we have never considered retrenchment of workers as an option because of the expected negative socio-economic impact that would have on our people. Even when neighboring states retrenched and/or reviewed wages downwards to match current revenue level, we have continued to carry the highest wage bill in the South East Region and it is on record that Abia pays the highest wage per worker in the region. Our two pronged plan to ensure sustainable bridging of the wages payment gap includes shoring up the internally generated revenue (IGR) of the state through the automation of the IGR collection, process to eliminate leakages, as well as support our entrepreneurs to grow and willingly pay their fair share of taxes and levies. We are mindful of the fact that until our monthly IGR exceeds the current monthly wage bill of N2.1b we will still struggle with regular payments because our state’s current revenue profile is lean and continues to carry the highest wage bill and also pay the highest wages per worker in the entire south east region. While we have religiously ensured that since the inception of the administration workers receive salary payments every month, our short term solution to tackling outstanding payments includes ensuring that workers and pensioners with arrears generously benefit from any extraordinary revenue inflow such as the Paris Club Refund. 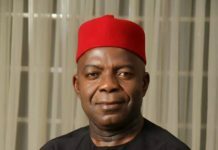 So far, Abia state received 3 tranches of Paris Club Refund and the transparent management and disbursement of the inflows have long been applauded by ICPC, peer review team of Nigeria Governors Forum (NGF), civil society organizations and trade unions, including the Nigeria Labour Congress, Abia State Chapter. When the initial refund of N10.6b was made to the state, the Federal Government advised states to invest 50% to outstanding wage payment and Abia under Ikpeazu verifiably complied. Indeed, Governor Ikpeazu was brave in deploying 50% of the fund belonging to more than 5 millions Abians to Service the wages of 38,000 workers. 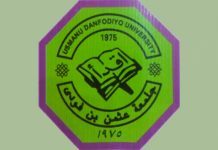 The remaining 50% was appropriated to meet the needs of the remaining 4.9m Abians. 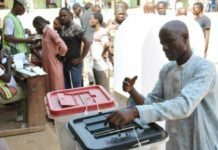 Workers and pensioners received N5.6b while N1.7b was devoted to road construction and repairs. Construction of bridges, including Osisioma (Flyover) interchange got N2.6b while hospitals and street lighting got N685m and N200m respectively. When the second tranche of N5.7b was received, Governor Ikpeazu gave ALL of it to workers and pensioners in the state. He remains the only Governor in Nigeria to toe that path of unquestionable love for workers and pensioners. It is also important to note that the allocated funds were directly disbursed by a committee dominated by trade unions who determined which outstanding to pay. Abia State government constituted a committee made up of the different labour union leaders, namely NLC, TUC, NULGE, NUP, NUT and Joint Negotiating Council to manage all extraordinary revenue inflows with a view to ensuring that workers and pensioners get their fair share. Even when Abia State received the 3rd tranche of Paris Club Refund, the government devoted about 60% to payment of workers and pensioners old outstanding. Out of N5.7b received by the state, workers got N3.2b while N2.5b was used to improve the infrastructure stock of the state. Workers and non workers benefit from the improvement in the infrastructure stock of the state. 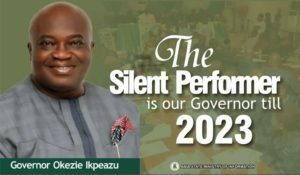 While Sun editors skirted the issue, thereby tacitly admitting that Governor Ikpeazu’s record in infrastructure development is unmatched in the history of the state and the South East region, it is important to point out that in 33 months of his administration he has delivered 53 completed road projects and the government is currently active at 78 other project sites spread across the state. 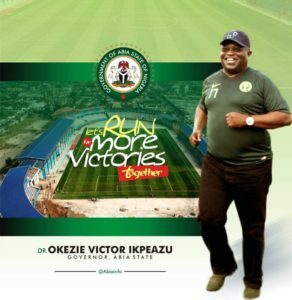 Even late Chief Sam Mbakwe will be proud of Governor Ikpeazu’s infrastructure development record, which has in no small way added to the quality and quantity of infrastructure stock of the state. Similarly, our late patriarch, Dr M I Okpara, would have acknowledged the extraordinary agricultural revolution going on in the state, with more than 4,000,000 tenera palm seedlings already planted, out of the targeted 7, 500,000 by 2019. Not to mention the poultry clusters, mushroom farms and even the ever improving rice and other cash crops yield in the state under Ikpeazu’s watch. In addition to constructing the first ever interchange (Flyover) in the state, the perennial flooding challenge at Ukwu Mango area and Faulks (Ariaria) Road has been tackled through innovative deployment of research and technology in road construction. For the first time in history of Abia State, 4 grade A contractors are working simultaneously on road projects in the state; Setraco at Faulks and PH roads, Arab Contractors at Aba Road Umuahia, Chinese Zhongbon at Osisioma Flyover and Bulletine at Abiriba-Nkporo road. More than 11 LGAs in Abia State have already benefited from Ikpeazu’s 10km road Per LGA initiative and to the glory of God, Ugwunagbo local government area now have the first asphalted road constructed by a state government since God created the earth. Our healthcare facilities are much more improved, with well thought out interventions made to ensure that life expectancy in Abia State exceeds National average. 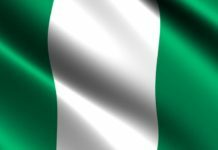 Our state is the first to launch telemedicine to support the integration of the operations of the 292 primary healthcare centers (PHC) with our increasing secondary and tertiary medical facilities. In education, 4 new model schools are under construction, across the 3 Senatorial districts of the state, in addition to 359 new classroom blocks built in all the wards of the state. On Ikpeazu’s watch, our state has maintained 1st position in West Africa School Certificate Examinations for 3 consecutive years. Even in trade and commerce, Abia is now leading on improvements in ease of doing business in the south east region, with our new one stop shop located at the New Abia Investment House constructed by the Ikpeazu administration already supporting investors. Our Enyimba Industrial City is set to be unveiled as the most attractive investment destination in Africa. Today, it takes 7 days to obtain certificate of occupancy in Abia State because of the application of technology in the process of verification and approval of applications. Our MSMEs are resurging and creating new jobs daily because of the well focused promotion and support of Governor Ikpeazu to Made In Aba brands. Even in the area of youth empowerment, we have moved away from the era of giving wheel barrows and motorcycles to young people as empowerment. They are being empowered through technical training and skill acquisition to become entrepreneurs and job creators. That is why we launched the novel education for employment (E4E) program in addition to funding MSME development programs. Not long ago, the administration of Ikpeazu sent 30 young Abians to China to learn automated shoe making. With their successful training and return, the state is set to set up the first automated shoe factory that will deliver more jobs and help keep our young minds away from crimes like “419”, rituals, Drug dealing, kidnapping, currency counterfeiting etc. 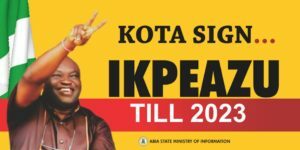 More importantly, Governor Ikpeazu is building infrastructure that will last for many years after he has completed his two terms of 4 years each. The era of “action” roads have given way to application of Rigid Pavement technology in constructing key roads in Abia State. Ikpeazu roads come with double drains that empty into suitable storm water collection points and more than 25 of his completed roads have survived at least 2 rainy seasons and still look like new roads done yesterday. When Abia people praise Governor Ikpeazu and offer their unsolicited endorsement for his second term in office, it is simply because they have seen the work he has done with limited resources. 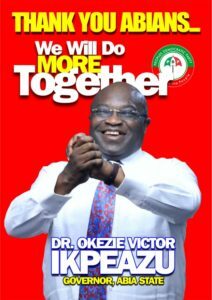 It is not necessarily an acknowledgment that he has done everything there is to do in Abia State. The great people of Abia State know that whatever has not been done will be done and hence the massive outpouring of love and support for the man they fondly call Okezuo Abia. We therefore wish to call on the editors of Sun to insist on professionalism even when faced with threats of sack from their owner. As professionals, they owe the nation and their collective conscience the debt of always speaking the truth, even when threatened with the “sword”. Otherwise it will only be a matter of time before The Sun Newspaper descends fully into infamy and earn itself the ignominious tag of FAKE NEWS medium. Honorable Commissioner For Information, Abia State.